Vampire Weekend may have recently released a single called "Sunflower," but the preppy rock band went ahead and covered Post Malone's "Sunflower" too, for good measure. 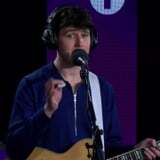 During a recent appearance on BBC Radio 1, Vampire Weekend offered a jazzy spin on the song Post Malone and Swae Lee originally collaborated on for Spider-Man: Into the Spider-Verse. Though I have a special place in my heart for the youthful original, Vampire Weekend's cover - with its smooth guitar and soulful backup vocals - is certainly a more mature iteration. Check out to it above, and feel free to jam out to the original below.